W H Allen, 1979, Hardback in Dust Wrapper. Condition: Good - in Good DJ. Some wear at DJ edges. Bumped at head & tail of spine and corners. Inscription on dedication page. 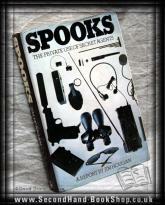 Spooks: an American expression to describe private spies and surveillance agencies. This book probes the private use of secret agents by multi-national corporations, the politically powerful, and the rich.The author reveals the spooks who do the haunting, who they are, how they work, and what they' ve done to us.